CLICK HERE to Read REVIEWER'S COMMENTS. This 304 page full-color textbook was written and edited by veteran cardiac cath lab interventionalists, and is essentially two volumes in one. 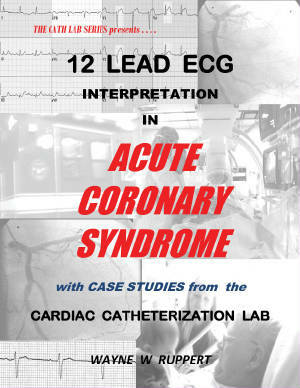 The first 92 pages present the basic principles of 12 lead ECG interpretation. The remainder of the book focuses on the evaluation of patients with Acute Coronary Syndrome (ACS) and low risk chest pain, as well as Brugada and Long QT Syndromes. 13 ECG patterns associated with ACS are presented, including the most subtle ECG changes most often missed by clinicians and the ECG machine’s automated interpretation software. The curriculum provides an in-depth, balanced approach to patient assessment, combining advanced ECG interpretation skills with patient history, risk factor and cardiac marker evaluation. Correlation of ECG leads with the coronary arterial distributions which commonly supply each region of the heart are reinforced by use of 24 case studies of ST Segment Elevation Myocaridal Infarction (STEMI), Non ST Segment Elevation Myocardial Infarction (NSTEMI), Unstable Angina, and Brugada Syndrome. STEMI Case Studies emphasize the ECG identification of the infarct related artery, and complications to be expected based on failure of cardiac structures commonly supplied by the obstructed arterial distribution. Case studies begin with patients' initial assessment data obtained in the emergency department and continue into the cardiac catheterization lab where coronary artery angiography illustrates the location of arterial obstruction. Key learning objectives for each type of Myocardial Infarction (MI) are highlighted. Additional conditions presented include: Brugada Syndrome, Long Q-T Syndrome, Wolff-Parkinson-White Syndrome, and Electrolyte Imbalances. 453 full color images, 135 review questions, and 114 ECGs reinforce the learning process. Target audience is all medical professionals whom are already competent in single-lead rhythm strip evaluation, and desire to become proficient in the 12 lead ECG evaluation of Acute Coronary Syndrome patients.